Eating Deliciously Healthy: LOSE 4-8 Pounds in Just 5 Days!! Do you want to jump start your new weight loss or healthy eating plan? Do you want to provide your body with an abundance of DELICIOUS nutrients, all while losing weight!? Do you want this year's resolution to finally be a SUCCESS? Do you want to sleep better & have TONS of energy? Are you concerned that you may have a gluten sensitivity, intolerance, or any other food allergy? An elimination diet/fast/cleanse is the best way to answer that question! What if I took the guess work out of your meals & supplied all of the recipes that you would need (and even more)? What if I offered to SUPPORT you (as much as YOU need) for the entire 5 days? Wouldn't it be EXCITING to be part of a POSITIVE & ENCOURAGING group of people that are walking along side of you? With all of this, how could you fail? Over 20 juice recipes (more than you will need for this cleanse). Including my daily "MUST HAVE" juice. Over 35 smoothie recipes that you can enjoy as you continue on your journey! Enrollment into my healthy weekly recipe newsletter. An extensive "A-Z Produce Prep List". A substitution list so that you are always prepared if you are running low, missing an ingredient, or simply can't find what you are looking for. My FULL SUPPORT, encouragement & guidance for the entire 5 days. 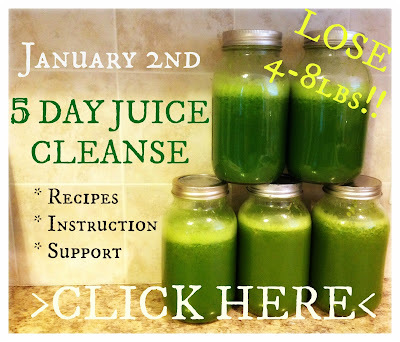 The support of everyone else doing this cleanse along with us. (priceless) PS - If you know someone else that could benefit from this…..invite them!